This latest debacle of a Buffalo Sabres season doesn't rest solely on the shoulders of coach Phil Housley. 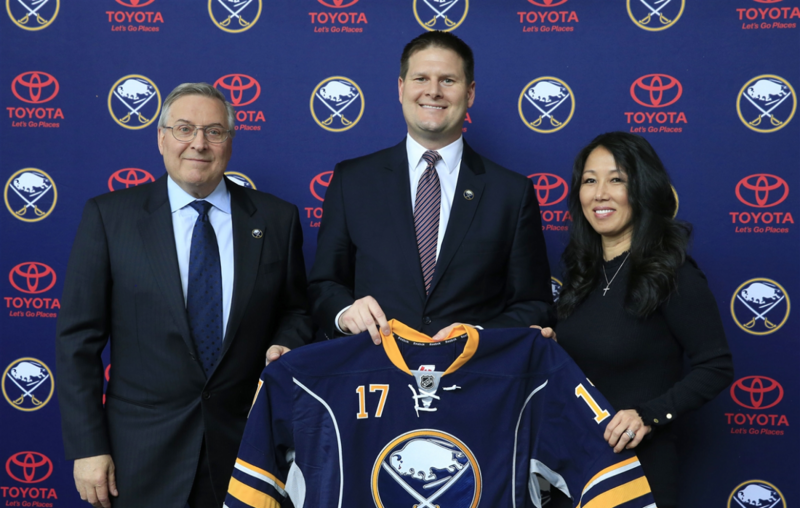 Or General Manager Jason Botterill. It's not the fault of Vladimir Sobotka or Marco Scandella or Rasmus Ristolainen either, no matter how many times fans want to take those three names in vain. Like the other derailed campaigns of the recent past, it starts at the top. The very top. This is no newsflash, but the bottom line is that Terry and Kim Pegula don't know what they're doing in running a professional sports franchise and have proven that over and over. They're business people, and pretty good ones in multiple ventures. But as for running the Sabres and the Buffalo Bills, they're fish out of water. They've been impatient when they should have stayed the course, and now two-team president Kim Pegula said Tuesday night in Arizona she needs to be more patient – exactly when it's time for some bold changes to be made with the Sabres. Terry Pegula then followed Kim by saying "something has to change, we don't know what." Well, what they should do is simple: Botterill should fire Housley and if he doesn't want to, he can leave as well. Botterill should then be told a president of hockey operations is going to be hired, just like the Ottawa Senators announced they were doing last week to assist GM Pierre Dorion. And after that, the Pegulas should get out of the way and spend their time figuring out the issues with their football stadium and how to fix their dumpy arena. A disclaimer here: The 30-minute media session with the Pegulas came in the early part of the Sabres' game at Ottawa. The questions certainly would have been even harsher and perhaps the answers would have been different had the interviews taken place with that game in the rearview mirror. The 4-0 loss to the Senators – easily the most dysfunctional team in pro sports this side of the Miami Marlins or New York Knicks – was an all-timer for a Sabres team quitting on its coach, its fans and its city. What happened to Jack Eichel's play-for-the-city speech Saturday in Montreal? Guess that lasted one game, the 46-shot loss Monday in New Jersey, where the Sabres dominated but could only score on Sam Reinhart's bouncer from center ice. Even that game is rife with embarrassment. Devils goaltender Cory Schneider, mostly rendered a has-been by injuries and poor play, is 2-0 vs. the Sabres this year with a 1.00 goals-against average and .975 save percentage, stopping 79 of 81 shots in the two games. Against the rest of the NHL this season? Schneider is 4-12-3, 3.29/.894. The Sabres made him look like a Vezina winner. It's just going to keep getting worse for a team that's won just 14 of its last 51 games and has the NHL's worst record since Nov. 28. Detroit is in town Thursday night and it will be interesting to see a) how many people show up to KeyBank Center and b) how surly their mood gets if things go badly again. While the Sabres essentially have packed their sticks and skates and gone home, the Red Wings have won four of five and are coming off a Western road trip that included wins at Vegas and San Jose. Yeesh. The Sabres then play Saturday night in NYCB Live, the refurbished Nassau Coliseum, against the New York Islanders and have home games Sunday and Tuesday against Columbus and Nashville, respectively. All three of those teams are desperate for points in the playoff race and will smell blood in the water against a Buffalo team counting the days to tee times. No matter what Botterill said in boxing himself into a corner last month in Tampa and no matter what the Pegulas said Tuesday in Phoenix, the New Jersey and Ottawa games have to be the last straw for Housley. They can't possibly bring him back now. This team, led by Eichel, has quit on its second straight coach. No two-game winning streak since December, no two-game streak in regulation since October and a humiliating 13-game road winless streak. Guess it wasn't Dan Bylsma's fault after all. The Pegulas should have had a president of hockey a long time ago. Enough of the Ted Blacks and Russ Brandons of the world. But they got spooked when Terry Pegula hired Pat LaFontaine in November 2013, and Kim Pegula ran him out before Easter the following spring in some sort of warped power struggle that's never been fully explained. Of course, there's never much of an explanation from Kim Pegula for the litany of people she's fired with her two teams or at Pegula Sports and Entertainment, which has long reeked of a frat house/soap opera mentality while the bosses live mostly in Boca Raton, Fla., and try to run things via Skype and video conferencing. Yet another sign of how backwards the Pegulas have things. They should be running the business and staying away from the teams. In the last five years, they've clearly grown to love the notoriety and celebrity status of being NFL owners, freely cavorting on sidelines before games and visiting the locker room afterward, while continuing to allow the hockey team to get run into the ground. The good news is they can still fix things. A knowledgeable president of hockey can really help. By my count, the NHL is pretty split on this issue. There are 28 team presidents in the NHL right now (none in Ottawa, Vancouver or Winnipeg), with 13 "hockey people" and 15 that were predominantly from the business side. The hockey folks included plenty of names you would know, like Cam Neely (Boston), Brendan Shanahan (Toronto), Glen Sather (Rangers), John Davidson (Columbus) and Luc Robitaille (Los Angeles). Four GMs – Lou Lamoriello on Long Island, Don Waddell in Carolina, David Poile in Nashville and Doug Armstrong in St. Louis – do both jobs, although that's not happening here. The Pegulas might say Botterill is already getting help and it's true he's hardly working alone. Assistant GM and Amerks GM Randy Sexton, 59, was one of the founders of the Ottawa franchises and has served as a GM for both the Senators and Florida Panthers. Fellow assistant GM Steve Greeley, 38, is on the radar to someday be a GM himself. But more help is needed for a first-time GM. Former Los Angeles GM Dean Lombardi, who won two Stanley Cups, could have been a presidential candidate when Tim Murray was fired as GM in 2017. Lombardi's doing consulting work in Philadelphia and apparently locked in through 2020. That's the kind of person the Pegulas need. Someone who can advise on trades, signings, a real development model and not the bizarre decisions being made this year with Lawrence Pilut, Alex Nylander, Casey Mittelstadt and Tage Thompson. For his part, it's not a great look that Botterill has accepted a job to be part of the three-headed group running Team Canada at the World Championships next month in Slovakia. He's going to be joined by deposed NHL GMs Ron Hextall and Ron Francis, who will have plenty of time on their hands. Botterill does not. He has to figure out who to hire as his coach. He has to prepare for the draft (and maybe actually even take a Canadian junior or two this time). He has to get Jeff Skinner re-signed and retool what's become his second straight wretched roster. It might be his final chance at it, too. Sad as it might be for Botterill's professional development, lots of work for Team Canada and a multiweek field trip to Slovakia aren't a great idea right now. Of course, the Pegulas will probably just tell him to Skype and video conference in when he's needed.